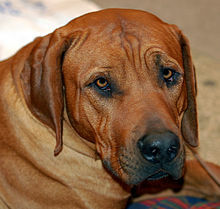 The Tosa (土佐, also called the Tosa Inu, Tosa-Ken or Japanese Mastiff) is a breed of dog of Japanese origin that is considered rare. It was originally bred in Tosa, Shikoku (present day Kōchi) as a fighting dog and is the only breed still used (legally) in Japanese dog fighting. Ownership is restricted in some countries as a dangerous breed. The Tosa varies considerably in size, with the Japanese-bred dogs tending to be about half the size of those bred outside the country. The Japanese breed generally weighs between 36 and 61 kilograms (80 and 135 lb), while the non-Japanese breeders have focused on dogs that weigh from 60 to 90 kg (130 to 200 lb) and stand 62 to 82 cm (24 to 32 in) at the withers. The coat is characterized by its short and smooth appearance and is often red, brindle, fawn or occasionally it can be a dull black. Maintenance of the coat is usually minimal. Dogs can occasionally tip the scale at 91 kilograms (200 lb). In Japan they are considered the equivalent of Sumo wrestlers, and are even depicted in wrestling accoutrement. 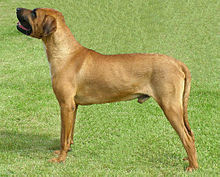 This breed originated in the second half of the nineteenth century. The breed started from the native Shikoku-Inu (an indigenous dog weighing about 25 kilograms (45 pounds) and standing about 55 centimetres high). These dogs were crossed with European dog breeds, such as the Old English Bulldog in 1872, Mastiff in 1874, St. Bernard, German Pointer in 1876, Great Dane in 1924, and the Bull Terrier. The aim was to breed a larger, more powerful dog. The heyday of Tosa breeding was between 1924 and 1933, when it was said that there were more than 5,000 Tosa breeders in Japan. Ownership of Tosas is legally restricted in certain jurisdictions. In the United Kingdom ownership is regulated under the Dangerous Dogs Act 1991, and in Trinidad & Tobago under the Dog Control Act 2014. A specific exemption of a British court is required to own and import Tosas legally in the UK. ^ Wofford, Taylor (September 1, 2016). "Dogfights in Japan Are a Family Outing". Newsweek. Retrieved December 21, 2018. ^ "Tosa Ken". Vetstreet.com. Retrieved December 21, 2018. ^ Coleman, Joseph (October 8, 1998). "Japan's powerful Tosa fighting dogs go for the throat in canine sumo". Deseret News. Associated Press. Retrieved 13 September 2018. ^ "Silence Reigns when Japan's Tosas Fight". Retrieved 13 September 2018. ^ "The Dog Control Act". The Trinidad Guardian. ^ "Dangerous Dogs Act 1991". London: HMSO/National Archives. 1991. Chapter 65. Retrieved 8 February 2010. ^ "Importing Animals". Retrieved 2 August 2018. ^ "Vejledning om hundelovens forbudsordning" (in Danish). Justitsministeriet. Archived from the original on 19 July 2011. Retrieved 20 July 2011. ^ "Fiji Pet Passport Regulations". Pet Travel, Inc. Retrieved 27 March 2017. ^ "Hvaða hundar eða hundakyn eru bönnuð á Íslandi?". ^ "Procedure to Import Dogs and Cats into Malaysia" (PDF). Malaysian Department of Veterinary Services. ^ "Importation of Pets in Malta". MFGC. 2 March 2010. Archived from the original on 5 November 2009. Retrieved 2 March 2010. ^ "Hayvanları Koruma Kanunu". Retrieved 26 April 2012. ^ "The New Zealand Department of Internal Affairs rules on dog control". ^ "Forskrift om hunder". Lovdata. 2009-08-25. Retrieved 25 August 2009. ^ "Agri-Food & Veterinary Authority of Singapore List of Scheduled Dogs" (PDF). ava. Archived from the original (PDF) on 25 December 2014. Retrieved 24 January 2014. ^ "Prohibitions et restrictions". Retrieved 25 May 2015. ^ "Controlling your dog in public: Banned dogs - GOV.UK". www.gov.uk. Ostuni, Steve (2003). Japanese Tosa. Allenhurst: Kennel Club Books. ISBN 1-59378-336-1. This page was last edited on 24 March 2019, at 00:58 (UTC).